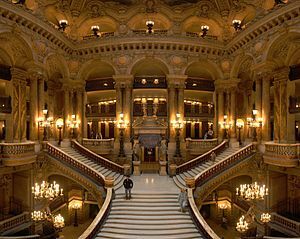 On a recent trip to Paris, I decided to take in an opera performance at the Palais Garnier. 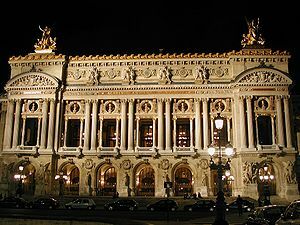 I’ve enjoyed many opera performances throughout my lifetime, including two in Paris, but this was to be my first at the Garnier, the opulent Beaux-Arts masterpiece designed by Charles Garnier as part of the great reconstruction of Paris during the Second Empire of Napoleon III. In advance, I noted that a French Baroque opera, Hippolyte et Aricie by Jean-Philippe Rameau was programmed one evening during my stay. I had always wanted to attend a live performance of a Rameau opera. The curtain was to be at 7:30pm. I decided to swing by the box office midday to purchase a ticket. I was traveling alone, so I thought there was a good chance that a single ticket was still available. I exited the Metro at the Opera stop and the view of the Palais Garnier nearly took my breath away. After climbing the steps past hundreds of seated spectators who were enjoying an outdoor rock concert (go figure! ), I entered the grand lobby. Again, the beauty took my breath away! I stopped at the information desk to inquire about ticket availability for that evening. Although the box office was closed for lunch (silly me — I was in France, after all! ), the gracious, articulate woman at the desk assured me that I would have no problem purchasing a ticket at the door, one hour before the curtain. Some may have regarded this as a wasted trip. For me, however, the stop only whetted my appetite further for an evening filled with music, dance and beauty. Anticipation is a lovely thing. After an afternoon of walking, sightseeing and visiting a friend, I returned to the Garnier just as the box office was opening for the evening. The line was long. When I finally reached the ticket window, I asked to purchase one ticket. Although the performance was nearly sold out, I intuitively knew that I had a good chance of securing a single seat. The box office representative’s first question to me (in perfect English, by the way) was, “Would you prefer a really lousy seat or a really great seat?” What a question! So, I was told that there was one “great” seat left. It was in a box on the mezzanine level. All of the other seats in that box were taken. The price was more than I had ever paid for a musical performance of any kind, anywhere in my entire life! After pondering a few moments and despite the painful conversion from Euros to dollars, I said, “d‘accord” and handed over my credit card. After enjoying an aperitif at the brasserie across the street, I walked back to the Garnier, ticket in hand. I climbed the stairs to the entry doors. I savored that grand entryway for the third time that day, then took the curving staircase up to the mezzanine level. My night at Opera Garnier had finally begun. The young usher showed me to the box where my seat was located. There were eight movable seats in the box, seven of which were already taken. My seat was actually a backless stool at the rear of the box. I wanted to settle in and read the program book I had purchased on my way in, but I found my seat very uncomfortable. In addition, no matter how I tried to rearrange its placement, I was unable to get more than just a sliver of a view of the stage. The stage was very close, but the tall patrons in front of me were obstructing my view. I tried moving my stool all the way to one side of the back of the box only to find that my view was then fully obstructed by the wall of the box. Then the overture began. As a musician myself, I enjoy the opportunity to watch the musicians in a pit orchestra. I could see none of them. I could just barely make out the fact that the conductor was a woman. When the curtain opened and the action began, my disappointment mounted. I could see only about a quarter of the actual stage. When the action was toward the wings, I could see nothing. Furthermore, I could see none of the projected supertitles. So, I could not watch the musicians. I could see a quarter of the action and none of the translations. I tried to sit back, close my eyes and just listen to the music, but I wanted to savor the entire spectacle that evening. I wanted to understand the story that was unfolding on stage. I wanted to see the expressions on the faces of the singers. I expected no less than the complete opera experience! As the first act ensued, my dissatisfaction escalated. I literally spent most of that first act deciding whether to leave and go back to my hotel room, unfulfilled and unhappy only two days into my vacation. What I decided, instead, was to find the usher who had seated me, communicate my dissatisfaction and ask for a refund. Next, I walked down to that gorgeous entry lobby. I’m sure I was frowning. A young man approached me. He may have been the house manager. He asked me what the problem was. I said that although I had never left an opera performance early in my entire life, I was so unhappy with my seat that I found it impossible to enjoy the performance. He looked at my ticket stub and said, “This is one of the best seats in the house.” Obviously, my expectations were higher than his. He then had me follow him back up to the mezzanine level. He said that he was going to take a look at my seat and see what could be done to improve upon my experience. Just as we got there, a man and a woman left one of the center boxes. The manager asked me to wait a moment while he went to appease the other couple. A discussion followed; I could not hear the conversation. The couple then left the hall completely. I wondered what their complaint had been. The house manager then had me follow him to the center box where there were now two empty seats in the front row. I took one. The other one remained empty the entire evening. My experience was now so different! No obstructions. No need to crane my neck. I had a clear view of the entire stage, the orchestra and the supertitles. I was able to quickly get back to the story line of the opera and salvage the entire evening! Were my expectations set too high? By me and/or the box office staff? Had the box office representative ever sat in the house and witnessed a performance? For that matter, had the ushers and house manager ever done so? Was I a victim of price gouging? What was the cost of the seat I actually sat in? Lesson #1: Be careful when setting expectations for your customers. Lesson #2: Remember to “Think like a customer.” Make sure you and your staff periodically experience the purchasing process from start to finish. And, don’t stop there. Take yourself through the entire user experience once in a while. Lesson #3: Train and empower your employees to make wise customer service decisions on their own. What do you think? What were other learning moments from my night at the opera?